Ricketts Cricuts: Jaded Blossom Stamp Release!! Hi there!!! If you arrived here from Candace, you are in the right spot! If not, and you want to start at the beginning click here! I am sooo happy this day is FINALLY here!!! A HUGE congrats to Candace and Michelle for joining together and finally starting their own business! With all of their creativity, I am sure that Jaded Blossom will be a big success! I am so excited and honored to be apart of such an AMAZING team!!!! These ladies are so creative and inspiring!! They are releasing so many cute sets this time that I couldn't make up my mind! I love the Valentines Circles set that I used on my sneak peek, you can see here! So now on to my project! 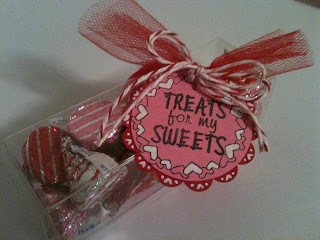 I used the Valentine Circle set for the Treats for my sweets sentiment and hearts circle! I used my white gel pen to add hearts and fill in some of the hearts for the circle! I attached it to the clear box with my twine and tulle! 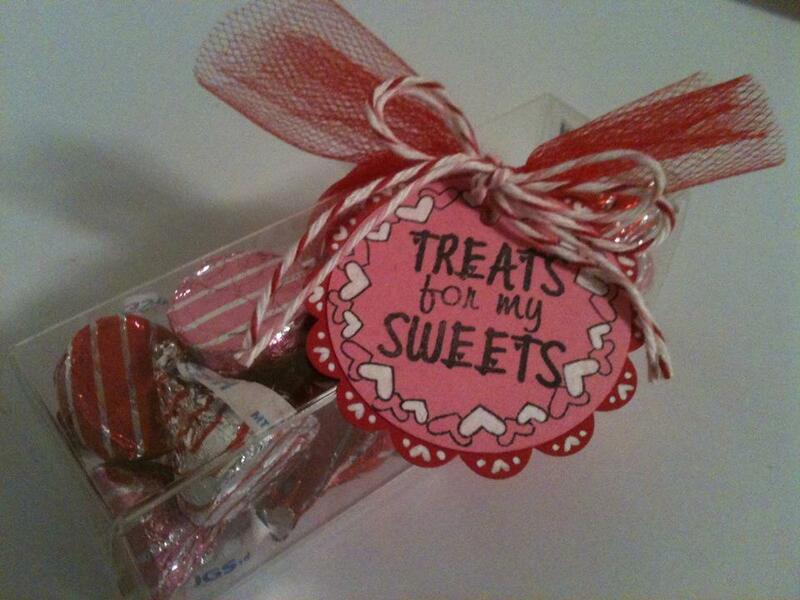 I couldn't decide to make this fun treat with the cone bags or the clear boxes but I love how they both turned out! You can order both the cone bags and clear boxes from Jaded Blossom! Candace and Michelle are giving away some amazing blog candy like a Cricut Cartridge, Echo Park Paper, and some yummy twine!! All you have to do is leave a comment here and become a follower of Jaded Blossom! Your Next stop is the amazingly talented Raven!! LOL_ smart very smart showing both LOL !!! they are all too cute chickie !! I love that gumball machine. Love Love that gumball set :) Great Job. Super cute!! I love them with both treat holders! Great job Kim!! 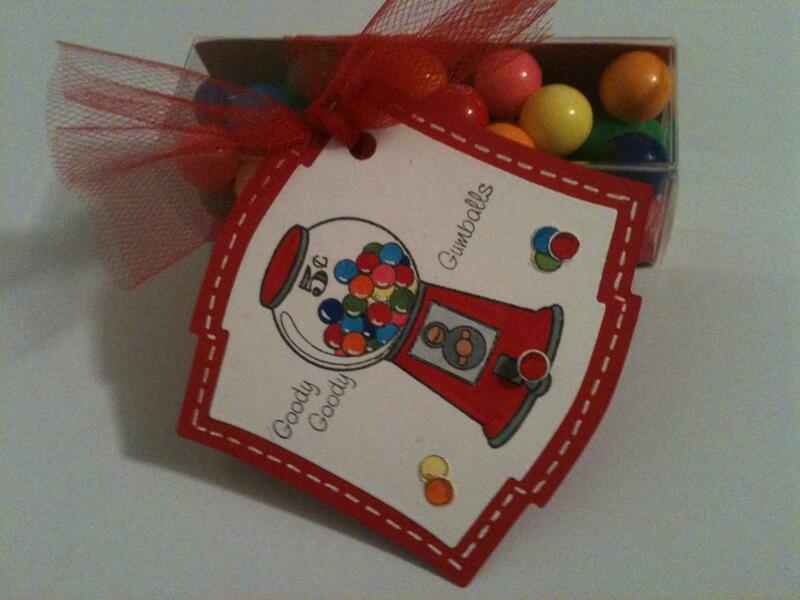 The gum ball set is adorable and now I think I really need the clear boxes too!! Definitely love the gumball stamp. It was great to see it used with actual gumball treats! Your projects are awesome and make it very hard to resist these stamps Great Job!!! What awesome projects you have!! Love your colors..they are so vivid and fun! ;) Thanks for sharing! 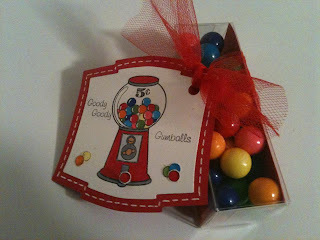 I love the Gumball machine and what a cute Idea for treats for the kiddos. Loved the projects, I can see why it was hard to pick one or the other. Both were great. mmmmm gumballs. Awesome job Kim! The more I go along this blog the more I realize how creative you all are. Love your ideas Kim. I love these projects Kim!! :) LOVE the treat box, its my fav! Both are super cute! Great details!! Cute projects! Love the gumballs! That circle stamp is so cute, lovely projects! Great projects! love the gumball stamp! it's a must have! Adorable, Kim! The Gumball stamp is my favorite! I love the gum ball stamps and ideas! Thanks for sharing your talent! Love it all. Love the gumball set. So stinkin' cute!! absolutely adorable projects! gumballs is my favorite... shhh! Both of you project are cute. Very Sweet gifts to give out. Thanks so much for sharing. Very cute projects! I love them! Thanks for sharing! What a great idea with the gumballs!!! Love your ideas and can't wait to see more!! Love that cute box!! LOVE em!!! Great ideas and very cute! Thank you for sharing! Hope I win!!! way too cute!!!! love your projects!!!!!!! Kim, these are wonderful! Love all the ideas! Love both of those tags! Cute way to make treats! Sooo cute Kim! Great job! LOve the tags. Very cute! OMG! Kim...These are adorable. I just love that gumball set and will definitely own it. You really made some cute projects..Awesome Job! AMAZING TAGS! Love it!New Follower! soooo cute, luv gum balls!!! Love all the colors! Did you use copics? The clear box is awesome - can you tell me was the tag a cut or a punch? Thanks! I love your treat holders! They are very cute! The circle set looks so neat! Can't wait to see the whole set. Thanks for sharing. Love the projects. These are great projects, thanks so much for sharing! Anything Valentine's is fab! Looking forward to more of your projects. Adorable! I just love the gum ball machine tags! Kim you must be absolutely giddy to be able to work with these stamps! Great job! Beautiful projects and great sets of stamps. Love them all. LOVE your projects!! I just have to have these stamps!! Fun treat holders. Its amazing what the stamps look like on the projects. Following all, love everything. Going to sit tomorrow with tea and my 11 year old and look at all of the blogs completely. We are just getting into this stuff. These are so cute. I'm loving the stamps. Love the gumball machine and the clever sentiment. Oh I love the gumball projects!! So cute. Super cute projects! I love the gumballs in the clear box! 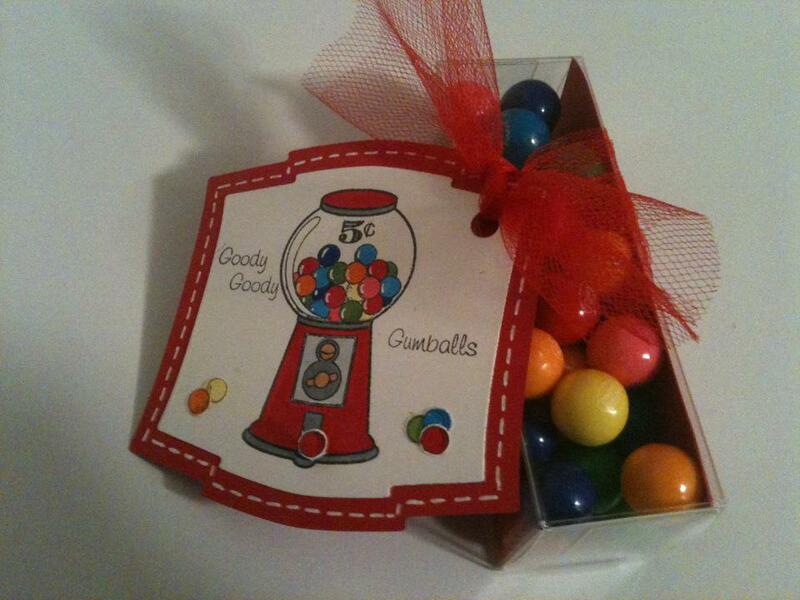 Love all your projects, that gum ball machine is so cuts! You did an amazing job...I especially love the gumballs!!! Great job as always Kim. I am a follower of all blogs on this hop. 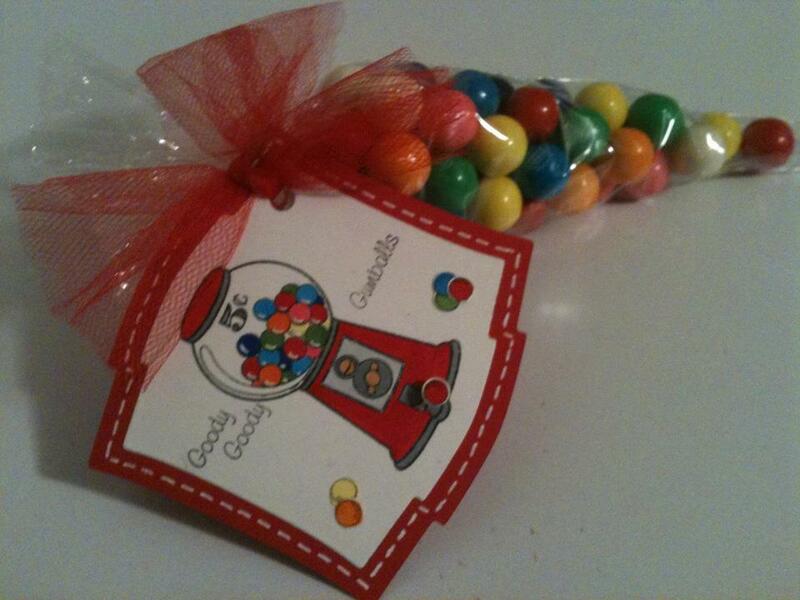 I can not wait to use the gum ball stamps for my son. He is obsessed with gum balls. Thanks for sharing! Very Cute Projects!! I want to make them now!! TY for the chance to win!! aaawww now I really love the gumball stamp!! tee hee I can make this tag!! thanks for sharing!! Love the tags thanks for sharing them and the chance to win. Love your projects. very yummy. Great projects. Thanks for the inspiration. Oh my goodness Kim super super job. I love the first one with the kisses in the box!!! !EMMMMM lol. I Lub them! I love both of your projects!! TFS!! Both projects are very cute. I really like the gumballs. I really like both of your projects, but the gumballs is super cute. AAAHHHH I love love love the gumballs. What a great idea. I can see how you couldn't decide if you wanted to use the boxes or the bags, it is cute both ways. Love your stuff and the stamps. :).